The end of May is busy with my birthday (yeah 43! ), Noah’s birthday (yeah 12!) and our wedding anniversay (yeah 22!) but we did manage to get in a couple of games recently. Lisa, Noah, and I played Mission: Red Planet. That was the first time I’ve played it with three and the first time for Lisa and Noah. Lisa ran away with the win getting a few good resource draws in areas outside of my bonus card area which I was working hard to meet. I think I like the game with more people. It adds a bit more chaos and more contention on the planet. The three of us also got in a play of Dos Rios. I received a copy from a BGG trade and it’s sat for almost 6 months. Noah and I really like the game despite the chaos of the river. You cannot play the game thinking that your campesinos are going to stay in the mountains for any length of time. You’ve got to play tactically and aggressively. The downtime during turns can be somewhat severe depending on who you play with but it didn’t seem to be a problem this go around. Noah and Lisa discussed a lot of their turns and in the end I got blocked out of a winning move and was left without an ability to block Noah’s subsequent move granting him the win. That’s all I’ve got time for right now. I’ll be posting some summary results for the first month of Uberbadger.com and our latest designs. Thanks to the early adopters/customers, sales are pretty respectable for only being in business for such a short time. More on that later. We met Monday night at Keith’s house for the May 2008 installment of AGN. Thanks for hosting Keith. We only had four so I was really wanting to break open my copy of the card/trick-taking game Tichu. I’ve owned this game for years and could never quite get it to the table. I’ve tried numerous times with my family with no success and they’re even euchre players! 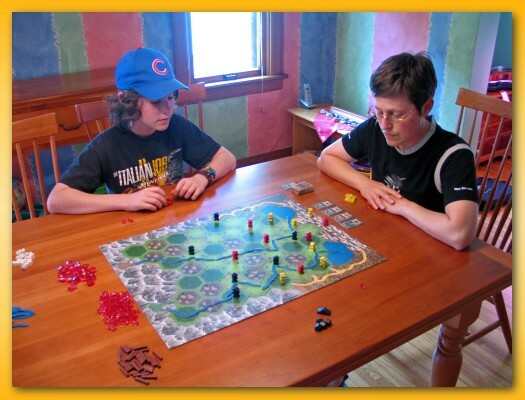 The game is best played with four playing across the table from your partner. You can play in the same type of setting at euchre and talk over the game play which I appreciate for casual non-gamer friends and family. We only played four hands to get a feel for the game but I think I made some converts. If you haven’t tried Tichu…grab a copy. You won’t regret it. The rest of the evening was taken up by Nautilus, the submarine/exploration game I’ve blogged about in the past. 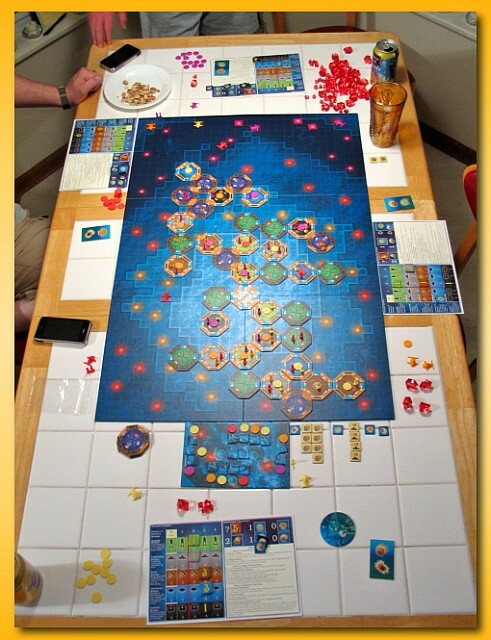 It only gets a 6.55 average rating on BGG which is respectable but, for me, it rates higher. I really enjoy the mechanics of buying and placing the research and habitation modules, moving researchers, activating modules, and building up your activation chart enabling you to be more effective in subsequent rounds. The game does exhibit a fair amount of luck since the position of the good treasures is not known and it takes submarine exploration to recover them. However, the use of your sonar can help mitigate that. In any case, I enjoyed myself as did Rich and Keith. I’m not sure Jason liked it all that much. He tends to not be fond of luck-based games. Or maybe it was the down time between turns which can be large at times. Note: I replaced the paper money with two sizes of plastic ‘Rubium’ nuggets I bought for my copies of Nexus Ops. Paper money is a pet peeve of mine. I can’t stand the stuff. 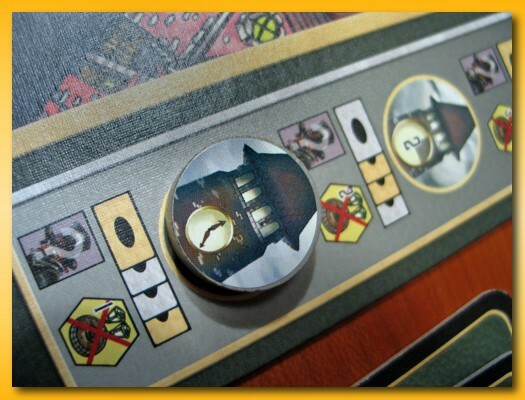 Mr. Jack is a two-player game designed by Bruno Cathala and Ludovic Maublanc. The artwork was designed by BGG member Piero Lalune (pierolalune). The game casts a player in the role of a detective and the other player in the role of Jack the Ripper. 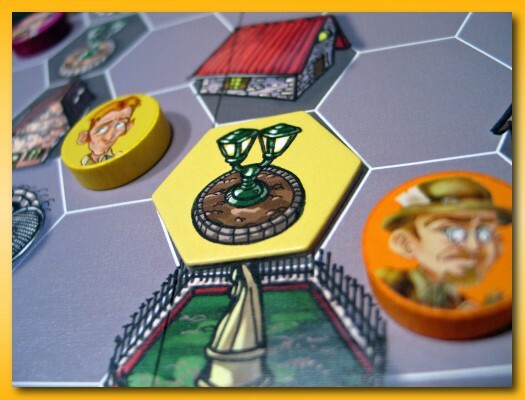 The game ends in eight rounds or earlier if Jack escapes the confines of the neighborhood depicted by the board or the detective manages to capture Jack. The detective has no physical manifestation on the board but instead directs the round characters markers in their movements towards capturing Jack. Jack, on the other hand, does have a physical presence and is represented by one of the characters on the board. 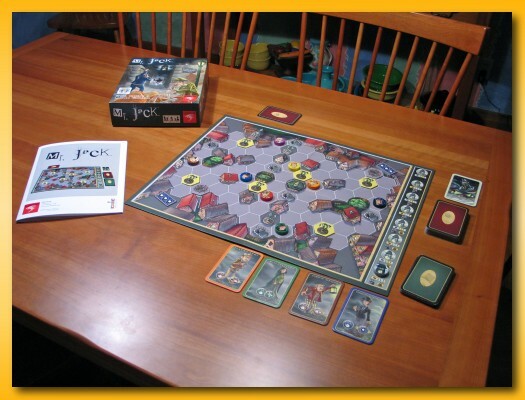 Which physical token represents Jack is chosen at the beginning of the game by drawing a card from the Alibi deck (described later) and kept secret by the player playing Jack. 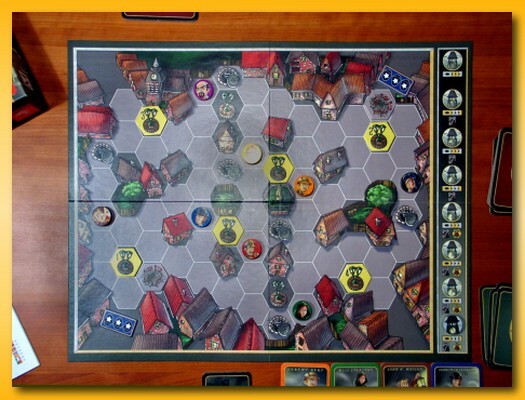 It’s the job of the detective to deduce which character is Jack and it’s the job of Jack to escape capture by surviving all eight rounds without being captured or to escape into one of the alleys at the four corners of the board (two of which will always be blocked by police cordons). The game hinges on a single core feature called witness/no-witness. At the end of each round, the character token representing Jack (known only to the Jack player) is either “in the light or next to another character” or not and the Jack player must announce whether it’s possible for Jack to have been witnessed/seen by another token during that round. The image above shows to characters standing in the hexes adjacent to a lit streetlight and so therefore are visible (in the light). In the upper left hand corner is another unlit streetlight with a purple character token next to it. This character cannot be witnessed since he’s ‘in the dark’. A witness card is turned to the appropriate side (seen/not-seen) depending on whether Jack was witnessed or not during the round. Since the detective is trying to determine which character is Jack, the detective can then eliminate all of the characters that are in the opposite position on the board. Those characters that have been eliminated, have their wooden disks turned over to a less colorful side indicating that these characters are guaranteed not to be Jack. Each round plays out in the same manner with the exception of the first four rounds where a single lit streetlight is extinguished leaving Jack more and more in the dark. The detective must work quickly in the first four rounds to narrow down his choices since it gets harder and harder to determine as the game progresses. The game comes with two stacks of sturdy placards. The green stack holds a card for each character (8 cards total). The red stack holds an alibi for each player. As mentioned before, the Jack player draws and secretly holds the identity of the Jack character at the beginning of the game leaving an alibi card for all the remaining players. At the beginning of each round, four character cards are drawn and turned face up (as depicted in the iconography below the clock tower in the image above). In the order depicted (the overlapping cards – gray is Jack, yellow is the detective), players choose a face up character card and take the action allowed by that character. Each round, one of the players will be able to perform two actions in a row. 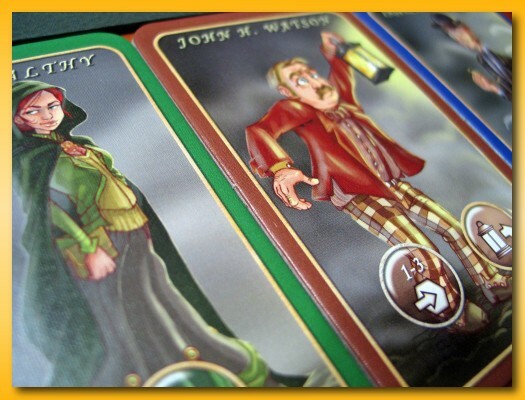 The character cards allow you to move the character token depicted on the card (at least one space and up to the number of spaces depicted on the card) and in most cases perform a special action. It’s by moving character tokens, using the sewer system to move to other areas of the board quickly, blocking the sewer systems, moving lights, moving police cordons from one alley to another, etc. that allow the detective to force characters into the light or out of the light and for Jack to hide. At the end of each turn there is a call for witnesses and then a light is removed (only the first four turns). 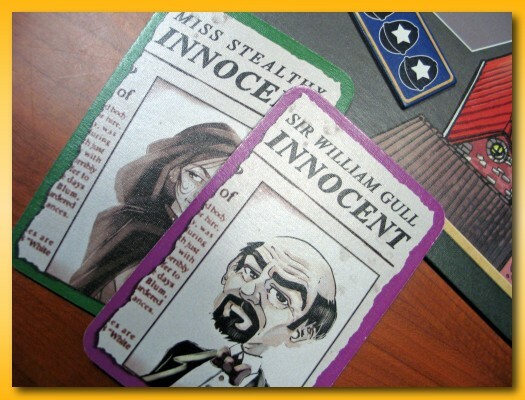 One of the character cards, Sherlock Holmes, allows the player to draw the top alibi card. The alibi card allows the detective to immediately discount one of the characters further whittling away the list of suspects. In general, the Jack player attempts to group as many characters as possible into either camp (witnessed or not witnessed) in hopes of keeping the detective from being able to discount large groups of suspects each round. Jack cannot escape into a side alley if was witnessed so Jack is always trying to not be witnessed to leave his options open for escape the following round. Sometimes, however, he’s better off staying with a larger group to be witnessed and then making his move in the following round. With a few games under my belt, it does have it’s moments. However, I doubt I’ll order a copy. One has to be very careful about deciding who and who isn’t witnessed each round. If you make a mistake, it can blow the game making it immediately obvious who Jack is. The rules surrounding Dr. Watson’s light, the lamp post light and being adjacent to another character are straightforward. However, in play it’s easy to call witnessed when you meant not witnessed, and vice versa. Lisa found it difficult to not think of herself as the inspector rather than the detective so she kept discounting his character. In her mind, since she was not playing Jack how could she (thinking of herself as the inspector) be Jack on the board. All of the characters on the board can be Jack and the detective does not have a character on the board. I’ve found it very difficult to escape so I’m curious if that rarely happens. A situation arose in my last game that illuminated a tactical move for future games. We were in the 6th round and there were two characters left and Jack had not been witnessed in the previous round. I made a run for it using the Jack character leaving him not witnessed but weakening my position in the final round (I was eventually captured). However, the other character was positioned well for making an escape through the sewer. The game is solid, and does provide a quick 2-player experience that feels a little bit like an adult version of Guess Who. The play feels somewhat repetitive and at times it’s difficult to understand what makes a good move given unknowns in the following round. Solid but not something I would add to my collection.